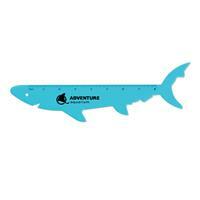 Have a little fun with this shark-shaped ruler! This 8-inch ruler can be used either as a ruler or a shark stencil. 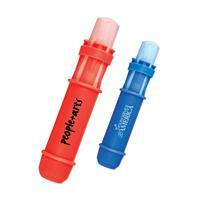 A perfect item for aquariums, zoos, or boat tours. One location imprint only. Have a little fun with this shaped-shaped ruler! This 8-inch ruler can be used either as a ruler or a fun stencil. 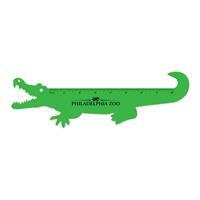 A perfect item for places like zoos, or boat or swamp tours. One location imprint only. 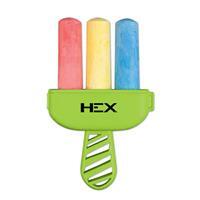 Fun, creative, and handy, this 3 piece chalk tool is the perfect item for summer events! 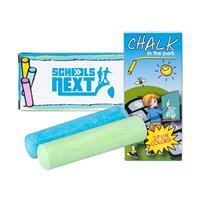 This chalk tool comes with assorted, non-toxic chalk and in retail packaging. One location imprint only. 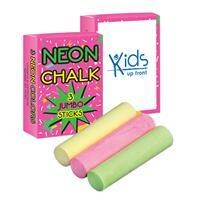 Our sidewalk chalk is great for outdoor promotions, school yard games and hopscotch. Safe & non-toxic for peace of mind. Assorted colors. An ideal giveaway for tradeshows or conventions. 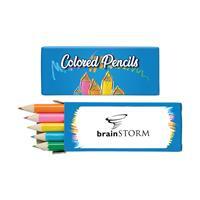 Encourage creativity in children with our 5 pack of non-toxic sharpened colored pencils. Measuring 3 1/2" by 1 1/2" this kid friendly product is a perfect tote bag insert! Choose from a plethora of imprint colors or no imprint at all, depending on your marketing project needs. 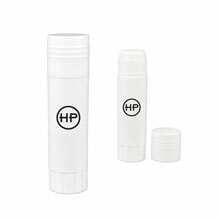 An ideal giveaway at tradeshows, conferences and fundraisers. Great gift for teachers, day care workers and parents. Measuring at 4 1/4" this kid friendly product is a perfect conference tote bag insert! 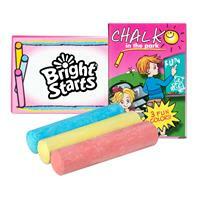 A trio of assorted color sidewalk chalk is great for outdoor promotions, school yard games and hopscotch. Safe & non-toxic for parents' peace of mind. An ideal giveaway for tradeshows or conventions. Choose from a plethora of imprint colors or no imprint at all, depending on your marketing project needs. 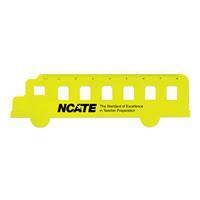 Our wax highlighter sets are great for schools, classrooms & corporate events! A great way to decorate glass, windows and more! Each set contains a neon pink, neon orange, neon yellow, neon green and neon blue.